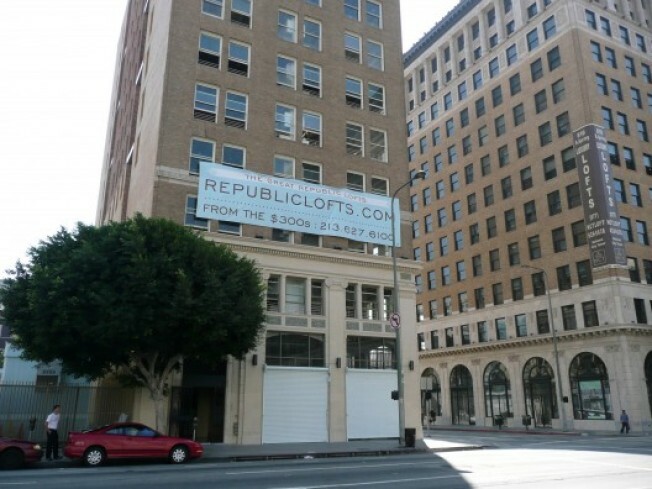 The latest edition of Downtown News looks at the Great Republic Lofts, that 72-unit building at 756 S. Spring St. that kicked off sales/tours last weekend. Given the number of condos on the market in downtown, what strategy does one take at these difficult-to-sell times? Like reps from other buildings, there's some talk about how "there's no other building like this one," as well as mention of the lower price point. Scenes from last Sunday's open house are in the gallery; there are three units pictured, the first is a 649 square foot condo priced at $319,000. (Homeowner association dues are averaging about $380; one parking space per loft, according to the sales rep.) Move-ins are in January, and the great rooftop hot tub is still under construction. Meanwhile, back to the News piece: editor Richard Guzman checks in with the Rowan Lofts and is told sales at the Historic Core development are going "quietly." Shhh.